Violet Olang, a volunteer teacher, was seriously injured in March 2009 when a reckless driver drove his taxi at high speed and crashed it with her inside. He walked away with bruises, but she was paralysed from waist down. Struggling with multiple medical problems, she wrote a book urging for safer roads. She also gave media interviews and campaigned for the cause from her wheelchair in the 18 months she lived after the crash. “Something can be done about it, and so many millions can be saved. Just fix the roads in a proper way, because so many accidents happen because of the poor quality of our roads,” Violet said in a video interview recorded three months before her death. Her appeal is the most passionate testimony in a new short video film released on YouTube this week by the World Health Organisation (WHO). 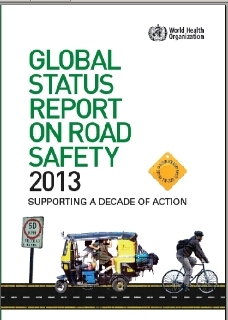 It accompanied the Global status report on road safety 2013. Statistics do help to illustrate how widespread and devastating the problem has become. The United Nations system now calls it a global public health and development crisis. According to WHO, which has collated national data from 182 member countries for its latest assessment, there were 1.24 million deaths worldwide from road traffic crashes in 2010 (the latest year for which full data is available). It works out to an average of 3,400 lives lost in road accidents every day. (For Sri Lanka, the daily rate is around 6 to 7 deaths.) And that’s only the tip of the deadly iceberg. For every fatality, many more are left with injuries – between 20 and 50 million cases worldwide, every year – causing temporary or permanent disabilities. That, in turn, leads to a significant loss of productivity and income for families and the economy as a whole. The vast majority of those affected are young people in developing countries – struck down in the prime of their lives. Over three quarters of them young men. “For those who are left behind, road traffic crashes lead to a tremendous amount of pain and suffering and – in many settings around the world – to economic hardship,” says WHO. What can be done to stem this tide? Understanding the complex problem is the first step. Physical and mental health of motorists, their vehicle condition, pedestrians’ behaviour and road conditions all contribute. The five key risk factors, according to researchers, are: drinking and driving, speeding, and failing to use motorcycle helmets, seat-belts, and child restraints. Having laws covering all these risks, and ensuring their proper enforcement, can help bring down road accident incidents as well as fatalities. So far, only 28 countries — covering 7% of the world’s population — have comprehensive road safety laws. The good news: since the first global assessment of road safety was issued in 2009, some 88 countries have been able to reduce their number of road traffic fatalities. But that number has, in fact, increased in 87 others (which WHO has declined to name). Pedestrians and cyclists are especially at risk: they account for 27% of all road deaths. In some countries this figure is higher than 75%. The global status report, in its appendix, has taken stock of Sri Lanka’s relevant laws and regulations. It says laws are already in place for national speed limits, drink-driving, motor cycle helmets and seat belts – but not as yet for child restraints. The report shows some gaps in laws and their enforcement. 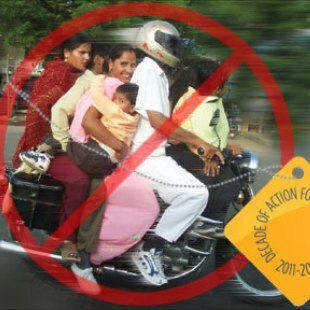 For example, while 99% of motor cycle riders are said to wear helmets, only 87% of their passengers do. Studies also found that 79% of drivers now wear seat belts but only 46% of front seat passengers do. In this law, enforced since October 2011, there is no requirement to wear seat belts on back seats. Sri Lanka related data in this WHO report has been provided by the National Council for Road Safety (NCRS) under the Ministry of Transport. Studies by the University of Moratuwa have contributed. Our roads have a long way to go before they become safer for all users. There is no regular inspection of existing road infrastructure, and no policies encouraging cycling or walking. There is also no policy yet to separate road users to protect the most vulnerable among them. Similarly, post-crash care is also lacking, even in urban areas. Less than 10% of those seriously injured in road accidents are taken to hospital by ambulance. Emergency medicine training for doctors and nurses is currently lacking. NCRS, set up in 1999 under the Motor Traffic Act, currently coordinates Sri Lanka’s participation in the global Decade of Action for Road Safety (2011-2020), declared by the UN. Their work covers policies, laws, research, advocacy, training and institutional aspects. Action is to be taken on all five ‘pillars’ identified for strengthening during the Decade: road safety management, infrastructure, safe vehicles, road user behaviour, and post-crash care. State, private, academic and civil society groups are being involved. In a candid appraisal of the status quo (Full text at: http://tiny.cc/NCRS), NCRS has listed many factors influencing traffic accidents in Sri Lanka. Among them are the well known ones: the growing number of vehicles (59% of accidents in the Western Province); and nearly half (48%) of all accidents involve those without a driving license, or with less than three years of experience. Less appreciated factors include frequent road damage due to poorly designed roads without pedestrian foot walks, wide shoulders, crossings, adequate lighting, road markings, and traffic signals. Yet theirs isn’t a pure legalistic or technocratic approach – the human dimension is also recognized. “Behind every statistic there is a story of a father or mother, son or daughter, brother or sister, grandchild, colleague, classmate or friend whose life was transformed in an instant by a road crash,” says NCRS newsletter, Road Safety in Sri Lanka. This entry was posted in Communicating Development, Disaster Communication, Documentary Film, Poverty, Public health, Road Safety, Sri Lanka, Transport and tagged child restraints, Decade of Action for Road Safety, drink-driving, Global status report on road safety 2013, Margaret Chan, motor cycle helmets, National Council for Road Safety (NCRS), Nellie Olang, seat belts, speed limits, University of Moratuwa, Violet Olang, Vivimarie VanderPoorten, WHO, World Health Organisation. Bookmark the permalink. 1 Response to When Worlds Collide #58: Making Our Roads Safer – Every Life Counts!